Only Northwestern could produce such an All-American in every sense of the word. To paraphrase the title of a 1943 Look Magazine feature, Otto Graham, excelled at everything he tried. Graham came to Northwestern on a basketball scholarship, but he’s best remembered for football. While at Northwestern, he was named an All-American in football and basketball, awarded the Chicago Tribune Silver Football (Big Ten MVP), and set several long-standing school records. He lettered in basketball, football, and baseball, studied French horn, earned a bachelor’s in education, and graduated early to join the navy during World War II. After serving in the navy, Graham played one season for the Rochester Royals of the National Basketball League (precursor to the NBA) and won a national championship in 1946. Later that year he was the first player signed to the newly formed Cleveland Browns of the All-American Football Conference (later the NFL). Graham played ten seasons with the Browns, each culminating in national championship appearance of which he and the Browns won seven. He was named All-Pro Football quarterback in 1951-52 and 1954-55. After retiring as a player he went on to coach at the collegiate level at the U.S. Coast Guard Academy team (1959-66) and at the professional level in Washington (1966–68). 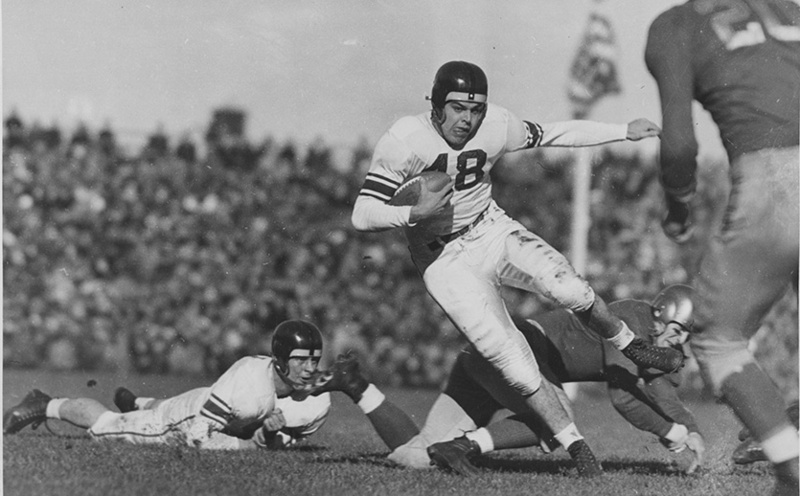 The Northwestern University Archives holds a large collection of Otto Graham’s scrapbooks, chronicling his illustrious career. Containing newspaper and magazine clippings, photographs, advertisements, correspondence, and ephemera, the scrapbooks document Graham’s remarkable achievements as one of the greatest athletes of his time.